Two Russian cosmonauts and a NASA astronaut have completed survival training in freezing weather in woods outside Moscow, the Gagarin Cosmonaut Training Center said Friday in a statement. Gennadii Padalka, Mikhail Kornienko and Scott Kelly constructed a makeshift hut, built a signal fire, and practiced first aid on each other in -20C or -4F weather as preparation for emergency space landings in remote forests or swamps. The future crew of the International Space Station is scheduled to launch aboard a Soyuz spacecraft in spring 2015. Kornienko and Kelly are planned to be the first astronauts to stay aboard the ISS for a full year, which would be the longest spaceflight by a NASA astronaut. Previous missions have been capped at six months. The all-time duration record is held by Russian cosmonaut Valeri Polyakov, who spent over 14 months aboard the Mir space station in 1994-1995. The emergency preparations are not without cause. Alexei Leonov, the first person to walk in space, spent two nights camped in -30C or -22F weather in a Russian forest with crewmate Pavel Belyayev after their Voskhkod spacecraft left them stranded 400km or 250 miles from their expected landing site in 1965. Russian cosmonaut survival kits include a specially designed heat suit, wool hat, fur boots and a pistol to fend off wolves and bears. WASHINGTON -- NASA, the Russian Federal Space Agency (Roscosmos), and their international partners have selected two veteran spacefarers for a one-year mission aboard the International Space Station in 2015. This mission will include collecting scientific data important to future human exploration of our solar system. NASA has selected Scott Kelly and Roscosmos has chosen Mikhail Kornienko. Kelly and Kornienko will launch aboard a Russian Soyuz spacecraft from the Baikonur Cosmodrome in Kazakhstan in spring 2015 and will land in Kazakhstan in spring 2016. Kelly and Kornienko already have a connection; Kelly was a backup crew member for the station's Expedition 23/24 crews, where Kornienko served as a flight engineer. The goal of their yearlong expedition aboard the orbiting laboratory is to understand better how the human body reacts and adapts to the harsh environment of space. Data from the 12-month expedition will help inform current assessments of crew performance and health and will determine better and validate countermeasures to reduce the risks associated with future exploration as NASA plans for missions around the moon, an asteroid and ultimately Mars. "Congratulations to Scott and Mikhail on their selection for this important mission," said William Gerstenmaier, associate administrator for Human Exploration and Operations at NASA Headquarters in Washington. "Their skills and previous experience aboard the space station align with the mission's requirements. The one-year increment will expand the bounds of how we live and work in space and will increase our knowledge regarding the effects of microgravity on humans as we prepare for future missions beyond low-Earth orbit." "Selection of the candidate for the one year mission was thorough and difficult due to the number of suitable candidates from the Cosmonaut corps," said head of Russian Federal Space Agency, Vladimir Popovkin. "We have chosen the most responsible, skilled and enthusiastic crew members to expand space exploration, and we have full confidence in them." Kelly, a retired captain in the U.S. Navy, is from West Orange, N.J. He has degrees from the State University of New York Maritime College and the University of Tennessee, Knoxville. He served as a pilot on space shuttle mission STS-103 in 1999, commander on STS-118 in 2007, flight engineer on the International Space Station Expedition 25 in 2010 and commander of Expedition 26 in 2011. 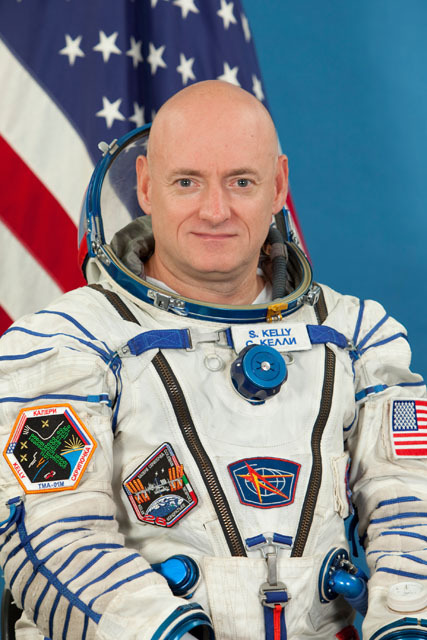 Kelly has logged more than 180 days in space. Kornienko is from the Syzran, Kuibyshev region of Russia. He is a former paratrooper officer and graduated from the Moscow Aviation Institute as a specialist in airborne systems. He has worked in the space industry since 1986 when he worked at Rocket and Space Corporation-Energia as a spacewalk handbook specialist. He was selected as an Energia test cosmonaut candidate in 1998 and trained as an International Space Station Expedition 8 backup crew member. Kornienko served as a flight engineer on the station's Expedition 23/24 crews in 2010 and has logged more than 176 days in space. During the 12 years of permanent human presence aboard the International Space Station, scientists and researchers have gained valuable, and often surprising, data on the effects of microgravity on bone density, muscle mass, strength, vision and other aspects of human physiology. This yearlong stay will allow for greater analysis of these effects and trends. PERSONAL DATA: Born February 21, 1964 in Orange, New Jersey. He has two children. EDUCATION: Graduated from Mountain High School, West Orange, New Jersey, in 1982; received a Bachelor of Science degree in Electrical Engineering from the State University of New York Maritime College in 1987 and a Master of Science degree in Aviation Systems from the University of Tennessee, Knoxville, in 1996. SPECIAL HONORS: Two Defense Superior Service Medals, Distinguished Flying Cross, Navy Commendation Medal, Navy Achievement Medal, two Navy Unit Commendations, National Defense Service Medal, Southwest Asia Service Medal, Kuwait Liberation Medal, Sea Service Deployment Ribbon, NASA Distinguished Service Medal, NASA Exceptional Service Medal, NASA Outstanding Leadership Medaltwo NASA Space Flight Medals, Russian Federation Medal for Merit in Space Exploration. Korolev Diploma from the Federation Aeronautique Internationale, 1999. Honorary Doctorate of Science degree from the State University of New York, 2008. EXPERIENCE: Kelly received his commission from the State University of New York Maritime College in May 1987 and was designated a naval aviator in July 1989 at Naval Air Station (NAS) in Beeville, Texas. He then reported to Fighter Squadron 101 at NAS Oceana, Virginia Beach, Virginia, for initial F-14 Tomcat training. Upon completion of this training, he was assigned to Fighter Squadron 143 and made overseas deployments to the North Atlantic, Mediterranean Sea, Red Sea and Persian Gulf aboard the USS Dwight D. Eisenhower (CVN-69). Kelly was selected to attend the U.S. Naval Test Pilot School in January 1993 and completed training in June 1994. After graduation, he worked as a test pilot at the Strike Aircraft Test Squadron, Naval Air Warfare Center, Aircraft Division, Patuxent River, Maryland, flying the F-14 Tomcat and F/A-18 Hornet. Kelly was the first pilot to fly an F-14 with an experimental digital flight control system installed and performed subsequent high angle of attack and departure testing. He has logged over 8,000 hours in more than 40 different aircraft and spacecraft and has over 250 carrier landings. Kelly holds a United States Coast Guard Third Mate’s license. Kelly retired from the U.S. Navy in June of 2012. NASA EXPERIENCE: Selected by NASA in April 1996, Kelly reported to the Johnson Space Center in August 1996. Following completion of training, he was assigned technical duties in the Astronaut Office Spacecraft Systems/Operations branch. A veteran of three space flights, Kelly has logged more than 180 days in space. He served as pilot on STS-103 in 1999 and was the Mission Commander on STS-118 in 2007. Following STS-103, Kelly served as NASA’s Director of Operations in Star City, Russia. He served as a backup crewmember for ISS Expedition 5 and as the Astronaut Office Space Station Branch Chief. Kelly also served as a Flight Engineer for ISS Expedition 25 and as the Commander of ISS Expedition 26. He currently serves as the International Space Station Operations Branch Chief within the Astronaut Office. Kelly and cosmonaut Mikhail Kornienko have been selected to serve a one-year mission aboard the International Space Station in 2015. The goal of the mission is to understand how the human body reacts and adapts to the harsh environment of space. Data from the expedition will be used to reduce risks to the health of crewmembers as NASA prepares to advance space travel beyond low Earth orbit. SPACE FLIGHT EXPERIENCE: STS-103 (December 19 to December 27, 1999) was an 8-day mission, during which the crew successfully installed new instruments and upgraded systems on the Hubble Space Telescope (HST). Enhancing HST scientific capabilities required three spacewalks (EVAs). The STS-103 mission was accomplished in 120 Earth orbits, traveling 3.2 million miles in 191 hours and 11 minutes. STS-118 (August 8 to August 21, 2007) was the 119th space shuttle flight, the 22nd flight to the International Space Station (ISS), and the 20th flight for Endeavour. During the mission, Endeavour’s crew successfully added another truss segment, a new gyroscope and an external spare parts platform to the ISS. A new system that enables docked shuttles to draw electrical power from the station to extend visits to the outpost was successfully activated. A total of four EVAs were performed by three crewmembers. Endeavour carried approximately 5,000 pounds of equipment and supplies to the station and returned to Earth with approximately 4,000 pounds of hardware and equipment. Traveling 5.3 million miles in space, the STS-118 mission was completed in 12 days, 17 hours, 55 minutes and 34 seconds. On October 7, 2010, Kelly launched aboard the Soyuz TMA-M spacecraft to serve a tour of duty on the ISS. 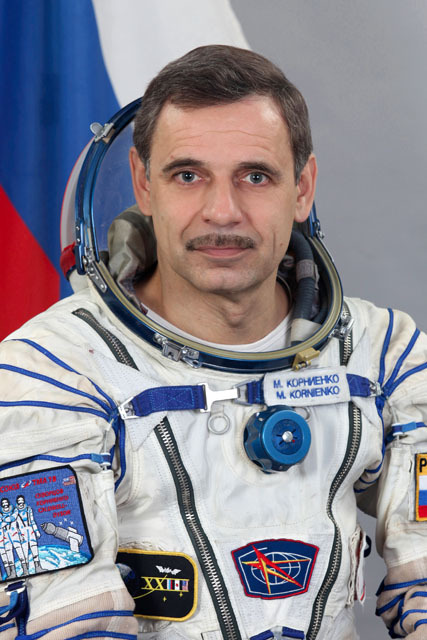 He assumed command of Expedition 26 once the Soyuz TMA-19 undocked on November 24, 2010. After a 159 day stay aboard the ISS, Commander Kelly and Russian Flight Engineers Alexander Kaleri and Oleg Skripochka safely landed their Soyuz spacecraft on the Kazakhstan Steppe on March 16, 2011. Russian cosmonaut Mikhail Kornienko, Expedition 23 flight engineer. Photo credit: Roscosmos/Gagarin Cosmonaut Training Center. BIRTHPLACE AND DATE: Born 15 April, 1960, in Syzran, Kuibyshev region, Russia. PERSONAL DATA: Married to Irina Anatolievna Kornienko (Savostina); daughter Natalia. EDUCATION: Graduated from a secondary school in Chelyabinsk, Russia, in 1977; served in paratroops in 1978 – 1980; in 1981 to 1987 he studied at the Moscow Aviation Institute and graduated with an engineering degree (aircraft engine mechanical engineer). EXPERIENCE: In 1980 Kornienko completed his military service and worked for the Moscow law enforcement agencies from 1980 to 1986. In 1986 started working for a mechanical engineering design bureau as a test engineer. In 1991-1995 he worked for commercial companies. In April 1995 Kornienko started working at the Energia Rocket/Space Corporation (RSC) as an engineer. He was responsible for technical documentation and software for testing and crew EVA training. SPACEFLIGHT TRAINING: In February, 1998 Kornienko was selected as an Energia test cosmonaut candidate, and in 1999, following basic training at the Yu. Gagarin Cosmonaut Training Center, was qualified as a test cosmonaut. From August 2001 to February 2003 Kornienko was assigned to the ISS 8 backup crew as an ISS flight engineer and Soyuz TM commander (for a launch on the Shuttle). Due to the Columbia tragedy the crew was reassigned. From March 2003 to August 2005 participated in RS ISS advanced training. From September 2005 to January 2006 participated in ISS advanced training. From February 2006 trained as ISS 15 bu engineer and Soyuz TMA bu flight engineer. From March 2007 to August 2008 participated in RS ISS advanced training. From August 2008 to April 2010 trained as an ISS 23/24 flight engineer and Soyuz TMA flight engineer. SPACEFLIGHT EXPERIENCE: From April 2, 2010 to September 25, 2010 completed his first spaceflight as a Soyuz TMA-18 and ISS-23 flight engineer with cosmonaut A. Skvortsov and astronaut T. Caldwell-Dyson (NASA). Performed a spacewalk that lasted for 6 hours and 43 minutes. Kornienko has logged 176 days 1 hour and 18 minutes in space. AWARDS: Golden Star of the Hero of the Russian Federation (April 12, 2011), Gagarin medal, Honorary citizen of Syzran (2010).